GREEN BAY — Aaron Rodgers threw for five touchdowns and the Packers continued their fast start to the season by defeating the Kansas City Chiefs, 38-28, at Lambeau Field on Monday night. 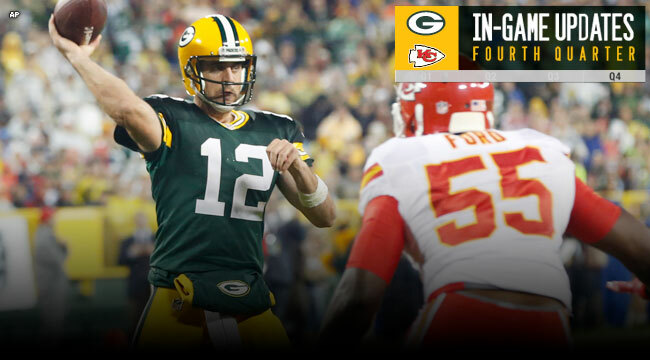 The Packers built a big lead and held on against a late rush by the Chiefs. The Packers defense was suffocating until the Chiefs posted their biggest yardage numbers of the game in the fourth quarter. Randall Cobb caught three touchdown passes and James Jones led the Packers with 139 yards receiving. At 3-0, the Packers hold a one-game lead over the Vikings in the NFC North, and will play in San Francisco this Sunday.